It’s Saturday night and BugLite and I are at home on our laptops doing our own things, so I’ve decided to post up tonight’s dinner recipe. 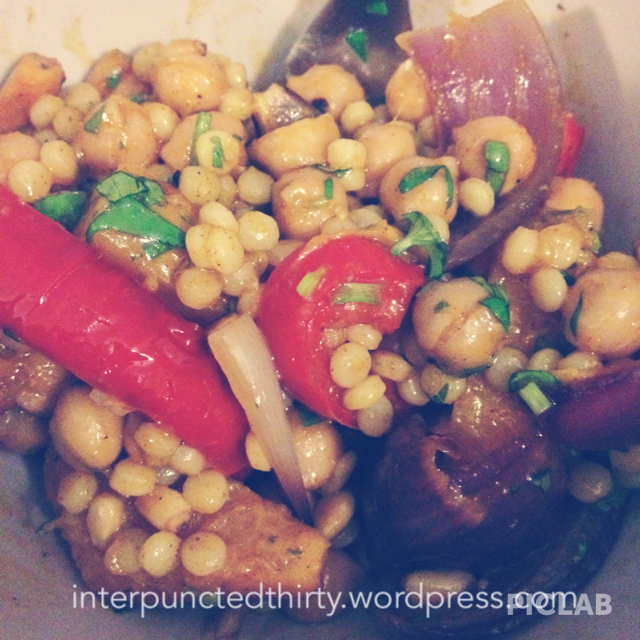 It’s a mix of a few different recipes that I’ve put together to make what I like to call ‘pumpkin and chickpea, plus three!’ – the ‘plus three’ being red onion, Israeli couscous and spices, which are the three other core ingredients that make this dish, everything else, is a bonus and added to taste. Preheat oven to 200degC. I have a fan force gas oven, so I’m not sure what this will be in other ovens. Cut pumpkin into 1cm slices and the onion and capsicum into quarters. Place all the ingredients and the garlic clove into a baking tray and cover with the spices (tumeric, smoked paprika, chilli, salt, pepper) and olive oil. Use your hands to distribute this love all over those veggies. Go on, just massage those spices in, mmmm… Place in the oven until pumpkin is tender. This is about 20-25mins in my oven, it may be longer in others. While this is cooking, prepare the Israeli couscous. This is usually a 1:2 ratio – one part Israeli couscous, 2 parts water/stock. Simmer on low heat for 10-15 mins with the lid on, or until the Israeli couscous is tender. Set aside with the lid on. If you’re having this with pinenuts, make sure they’re not salted, and I recommend dry roasting them. Set aside until time for construction. If you’re using the canned chickpeas, drain the excess water and rinse before serving. When the vegetables are ready, take them out and get ready for magic to begin. Place the veggies in a large bowl, add the Israeli couscous, chickpeas and pinenuts. Take the garlic clove, smash and mush with the back of the knife, and add to the rest of the ingredients. Add the coriander, and then mix that baby up! Serve with a garnish of coriander, and match it with a nice dry white wine. Bon appetit!